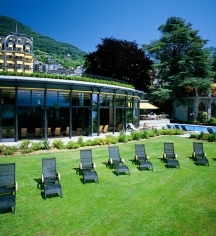 On the shores of Lake Geneva in Switzerland is the Fairmont Le Montreux Palace, an elegant luxury historic hotel. The Palace was built in just 18 months and offered heat, electricity, and both hot and cold running water in the private baths, at a time when few hotels did. The hotel has seen two wars, during which it was used to house wounded soldiers, and served as the location of the Montreux Convention, which governs access to the Black Sea to this day. Fairmont Le Montreux Palace has over 230 guestrooms, featuring amenities such as bathrobes, slippers, deluxe bath toiletries, and a mini bar. Meeting spaces on the premises can hold up to 1,200 guests for conventions, galas, meetings, and events. The wedding facilities and services are second to none, with expert planners, several available wedding packages, and the option for a marriage ceremony in a palace. The hotel also features several on-site dining areas, including a bar & lounge, a jazz café, live music, and healthy bites that can be eaten poolside, indoors, or outdoors. The Willow Stream Spa provides services for both guests and locals, providing facials, deep tissue massage, and services for men and children. The Montreux Convention, which governs access to the Black Sea and is still an important piece of international law, was signed at the hotel on July 20, 1936. Parking: On-site parking is available; fees apply. Pet Policy: $30.00 CHF per pet, per day. Pets are not allowed in restaurants. 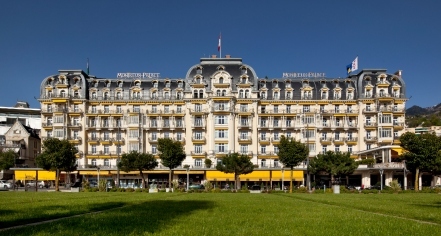 On the shores of Lake Geneva in Switzerland is the Fairmont Le Montreux Palace, an elegant luxury historic hotel. The Palace was built in just 18 months and offered heat, electricity, and both hot and cold running water in the private baths, at a time when few hotels did. Learn more about the History of Fairmont Le Montreux Palace .